Elders Insurance, a subsidiary of QBE Insurance is a provider of landlord insurance, home & contents insurance, car & motorcycle insurance, commercial motor insurance, and various types of business cover. Canstar has researched and rated 46 landlord insurance products from 41 different providers to determine who offers outstanding value for customers. 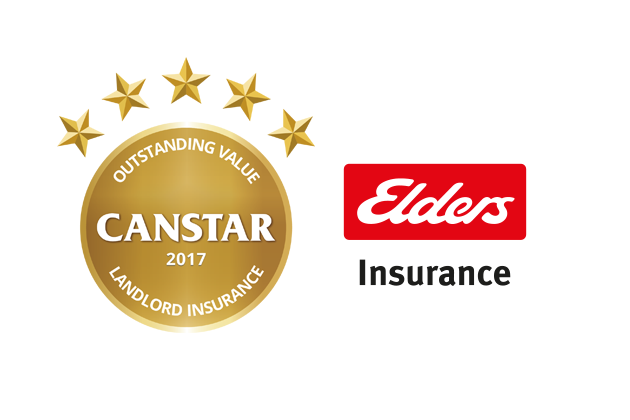 After extensive analysis, we are pleased to announce that Elders Insurance has won the 2017 Outstanding Value Landlord Insurance Award. Congratulations, Elders Insurance! Elders also performed extremely well in New South Wales, Western Australia, South Australia, and North Queensland. One of the main drivers of Elders’ award-winning performance was its competitive pricing; for each state and region considered, Elders’ premiums were below the market average. For building and contents insurance on houses, Elders’ premiums were particularly good value in Tasmania, Queensland, and North Queensland. In Tasmania, its annual premiums were just $741.50, which is 29% less than the market average and the lowest on the market as a whole. Queensland and North Queensland building and contents cover from Elders cost 20% and 15% less than the market average respectively. For contents insurance on units, Elders Insurance also offers excellent value, costing at least 20% less than the average in every state measured. Annual premiums for contents cover on Tasmanian units again were 29% cheaper than the market average, while Elders customers in Western Australia could pay 27% less than average for unit cover. In the market for Landlord insurance? The below comparison table features Elders Insurance products currently on the market for house properties sorted by our star rating (Highest-lowest) located in NSW. Damage due to storms, excluding the damage caused to gates, fences, retaining walls, or swimming pools. Additionally, Elders Landlord Insurance is flexible. With an Elders policy, you have the option of paying monthly instead of annually at no extra cost. You can also lodge your claims over the phone if necessary, and there is a 24-hour helpline available to address any concerns or questions you might have. 100% owned by QBE Insurance, Elders Insurance is one of Australia’s largest regional and rural insurers, and it operates in more than 150 communities across the country. Its product range includes farm insurance, business insurance, home and motor insurance, as well as landlord insurance. Elders was founded back in the late 1880s, and has over 100 years’ experience providing insurance policies in metropolitan areas. To help its customers understand more about insurance and related products, Elders supports the Know Risk program, designed by the Australian and New Zealand Institute of Insurance and Finance (ANZIF). Elders is driven by a strong desire to make connections with local communities and invests millions of dollars into communities around Australia each year. In addition to the Know Risk program, Elders supports a range of local sporting clubs, as it considers these clubs to be the backbone of many rural communities across the country.